This special issue of Ada: A Journal of Gender, New Media, and Technology brings together work on feminism, technology, speculative storytelling and some, but not all, of its contradictions. It builds on the growing body of feminist scholarship, and technological, design and artistic interventions that have prompted specific interrogations and practices with and around the speculative. Feminist techno-speculative storytelling, fiction and design gestures towards a set of geographies of the imaginary and of their materiality deeply inspired by social justice and political transformation. Walidah Imarisha (2015) illustrates well this point when she suggests that “whenever we try to envision a world without war, without violence, without prisons, without capitalism, we are engaging in speculative fiction” (2015, 3). The contributions in this special issue dream about specific geographies of the imaginary which we consider an active practice of doing. A practice that is situated, plural and collective, and which involves non-stop loops in which feminists are reading, quoting, conspiring, studying, supporting and summoning each other. A galaxy-like scene very much resembling our art cover Las amigas hackers (Figueroa n.d.) with its people, collectives, networks, vocabularies, codes and languages. Such practice also attempts to acknowledge contradictions that are inescapable and which reveal themselves through situated knowledges, and/or by the act of cultivating specific ways of seeing and doing (or not) (Haraway 1988, Murphy 2012). In her book Seizing the Means of Reproduction, Michelle Murphy (2012) uses the term “Doing feminist technoscience” to encapsulate the practice of the 1970s feminist self-help movement. This movement understood techno-scientific knowledge as produced in the process of struggle and at the heart of science and technology studies and practice. These practices included collective vaginal self-examination and biopolitical practice of menstrual extraction. By highlighting the tensions and contradictions that emerge from the doing, Murphy stresses that the white feminist self-help movement was largely oblivious to the experiences of Indigenous, Black and Chicana women in the USA, and of the bio- and necro-politics of reproductive technologies in the Global South. Making visible the blind spots and contradictions of the feminist self-help movement is done however in a spirit of generosity away from destructive criticism. In addition, Banu Subramaniam, in an interview with Bauchspies and De la Bellacasa (2009), identified the doing as a recurrent missing dimension in feminist science studies. She wrote: “[m]oving beyond critique to practice is the next critical move” (341). Doing for her means that feminist science and technology scholars need to build their own laboratories and their own journals to operationalize their vision. Accordingly, feminist scholarship in technoscience and technology has increasingly mobilized the term doing. Mobilizing this term within scholarship reaffirms the need for more feminist approaches to hacking propelled and made visible by doing feminist techno practices. The importance of doing has always been at the heart of feminist movements. Current efforts of doing with others or doing together feminist technologies are exemplified in an AfroCyberFeminist exhibition in Paris inspired by the work of Octavia Butler (Gueye, Lechner, and EnsadLab 2018); by Pumzi, a short Kenyan afrofuturist science fiction film, which tackles the issue of “new eco-feminist” resistance within a deep surveillance ecosystem; the TransHackFeminist Convergences (Anarchaserver 2018b) where transfeminism meets the politics of hacking; the GynePunk (n.d.), and Marias Clandestinas (Yang n.d.), who design technologies for the re-appropriation, and seizing, of gynecology and health processes, and the setting up of feminist infrastructures including feminist servers (Anarchaserver 2018a), hackerspaces and the defense of the electromagnetic spectrum as a commons, among many others. Building on Murphy’s (2012) understanding of doing feminist technoscience, on Donna Haraway’s (Terranova 2016) work on speculative fabulation, which she understands as being everyday practices of storytelling, and on the ongoing practice of feminist activists, artists and technologists, we propose a form of doing that is speculative. We suggest that doing speculatively in a context of technology helps to prefigure the types of feminist technologies, technoscience and infrastructures needed to (re)imagine and strive for systemic transformations. Doing speculatively allows us to foreground feminist imaginaries that reconsider and reshape technologies, which are constituted by processes, institutions, knowledges, bodies and artefacts. Doing speculatively is political as it involves one of the multiple ways to re-imagine technological and infrastructural entanglements that shape our world. It also serves to expose technologies and infrastructures that have furthered (neo)colonial processes such as the stealing and erasing of indigenous scientific knowledges and techniques, and the shattering of liberation struggles. By shedding light on these contradictions, doing speculatively also attempts to de-privilege and de-glorify science and technology. De-privileging the assemblage of humans and technology (non-human) echoes the act of making visible and valuing other types of assemblage with the non-human, such as with land, animals and plants (Sundberg 2014). Doing speculatively is infrastructural as it allows for the circulation of ideas, fabulations and dreams among others. Through infrastructure, doing speculatively attempts to disrupt or at least shed light on past and present science and technology’s materialities which are rife with contradictions and tensions. While technologies (in particular) are being used by social justice movements as part of larger strategies for freedom, sovereignty, or emancipation, they are still embedded in processes of violence in terms of labor, resource extraction, gender and/or race. Doing speculatively attempts to address and make visible the cycle of production (from extraction to factory assemblage) that is too often invisible in feminist technological quests to create new imaginaries of feminist technologies. In this way doing speculatively is a measure to counter the era of extreme extractivism (terra, soil, natural, species, minds, bodies, data and dreams) in which we live and which endangers imaginary capacities. Doing speculatively is about healing and affect. It requires people to care enough about feminist technologies to dream about them in order to better build them. For stories to act as potential agents for transformation, they need caring, appropriate and affective infrastructures to shelter them. As Haraway points out, “right now, the earth is full of refugees, human and not, without refuge” (2015, 160). Dreaming about the backbone or network architecture, the digital and physical, that our stories and dreams need requires attentiveness, patience and love. As exposing the violence, boredom, and cynicism of current technologies and its built infrastructures and trying to propose ways to go beyond such dystopic realities are tiring and draining, our affective networks are paramount. 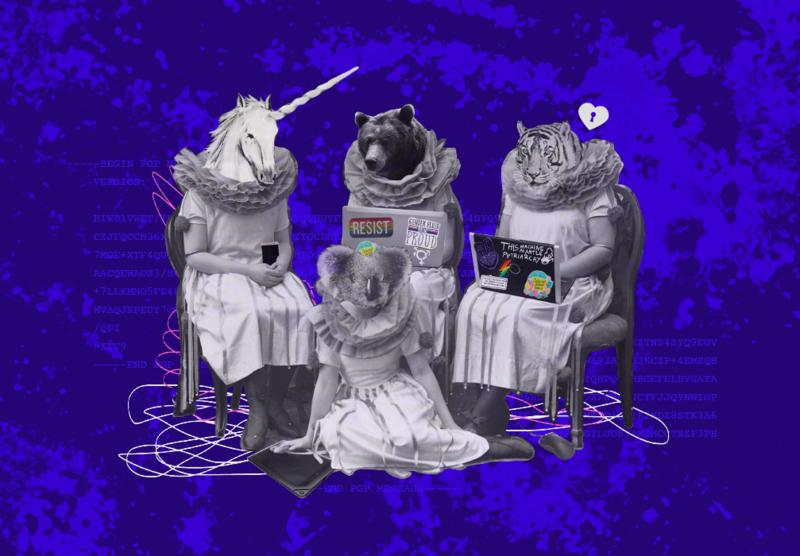 The ensemble of academic and artistic interventions presented in this special issue embody and further the notion of doing speculatively to re-imagine feminist technologies and hacking. First, it reminds people in the Global North that feminist speculative interventions to reimagine hacking have been used outside of the western world and cinema (Mokhtar). Second, doing speculatively exposes the gendered and racial dimensions of the technological cycle of production, and suggests that the politics of visibility are part and parcel of a feminist hacking and making practice (Lee Kirtz). What seems to be distinctive about doing speculatively is its focus on the ways in which it is mobilized to fight gender-based violence. Doing speculatively can be triggered by the disappointment with technologies such as apps that were thought to have potential in the fight against sexual and gender-based violence. In particular, speculative design has been a way to engage with feminist practices that might currently be seen as outside of the realm of the possible, but allow us imagine the societal and technological conditions needed to end sexual violence (Bivens). It can also be used as a queer intervention to document and respond to feminicide (Chavez). Moreover, speculative feminist writing can become a methodology for reappropriating healing and turning a problem into a potential solution (Egaña Rojas). In that same vein, designing speculative technologies allows us to re-appropriate reproductive technologies (The Hackers of Resistance [HORs]) and technologies like ultrasounds (Possible Bodies) in order to imagine and invent new worlds away from all forms of violence. Finally, doing speculatively makes visible the contributions, practices and infrastructures that have too often been in the background. Like Kuchera’s “The Walkthrough,” doing speculatively is a playful and at times hidden way to reconsider the role of women in the history of technology particularly cryptography, steganography and the development of clandestine information practices (Kuchera). Last but not least, doing speculatively, is about the ways in which feminist hacking practices create and share their infrastructures (Wuschitz and Savic). We hope that this special issue will trigger a desire to dream technologies, connect with the moon, swim with the medusas, meet with friends and nurture networks, write science fiction and radical storytelling, twist each technique, device and artefact around us, and have fun–a lot of fun–doing it all! We just need to remember that we can change it all. We would like to thank all of those who contributed to this special issue in your acts of writing, drawing, dreaming, peer reviewing and translating—whether your contribution was published or not. In particular, we would like to thank the peer reviewers for their invisible, but crucial work: Maria Awa, Laura Benítez, Javier de Rivera, Radhika Gajjala, Priya Jha, Pallavi Guha, Maya Indira Ganesh, Alexis Lothian, Maxigas, Cornelia Sollfrank, Carol Stabile and all others who peer reviewed with a pseudonym. We thank Constanza Figueroa for her beautiful cover art. Moreover, we are grateful to webmistress Eva Peskin, copy-editor Kaitlyn Wauthier and editors Radhika Gajjala and Carol Stabile. Thank you all for your generous work and sustained guidance. Indigenous cosmologies are real, they are not speculative. Anarchaserver. 2018a. “History of Anarchaserver and Feminists Servers Visit This Section.” Anarchaserver.org, April 7. http://anarchaserver.org/mediawiki/index.php/History_of_Anarchaserver_and_Feminists_Servers_visit_this_section. Anarchaserver. 2018b. “Main Page.” Anarchaserver.org, April 5. http://anarchaserver.org/mediawiki/index.php/Main_Page#TransHackFeminist_Convergence. Bauchspies, Wenda K., and Marıa Puig de la Bellacasa. 2009. “Feminist Science and Technology Studies: A Patchwork of Moving Subjectivities. An Interview with Geoffrey Bowker, Sandra Harding, Anne Marie Mol, Susan Leigh Star and Banu Subramaniam.” Subjectivity 28: 334–344. doi: 10.1057/sub.2009.21. Figueroa, Constanza. n.d. “My female hacker friends. VRAM!https://www.flickr.com/photos/kalogatia/. Gueye, Oulimata, Marie Lechner, and EnsadLab. 2018. Afrocyberfeminism: Dans le sillage d’Octavia Butler. http://www.afrocyberfeminismes.org/. GynePunk. n.d. Tumblr Site. http://gynepunk.tumblr.com/. Haraway, Donna. 1988. “Situated Knowledges: The Science Question in Feminism and the Privilege of Partial Perspective.” Feminist Studies 14 (3): 575–99. ———. 2015. “Anthropocene, Capitalocene, Plantationocene, Chthulucene: Making Kin.” Environmental Humanities 6: 159 -165. Imarisha, Walidah, Adrienne M Brown, Sheree R Thomas, and Institute for Anarchist Studies. 2015. Octavia’s Brood: Science Fiction Stories from Social Justice Movements. Oakland, CA: AK Press. Murphy, Michelle. 2012. Seizing the Means of Reproduction: Entanglements of Feminism, Health, and Technoscience. Durham, NC: Duke University Press. Kahiu, Wanuri. 2009. Pumzi, film, 21 minutes, posted by Awali Entertainment. https://vimeo.com/46891859. Sundberg, Juanita. 2014. “Decolonizing posthumanist geographies.” Cultural Geographies 21 (1): 33-47. doi : 10.1177/1474474013486067. Terranova, Fabrizio, 2016. “Donna Haraway/Speculative Fabulation,” YouTube video, 4:44, posted by Fabbula Magazine, May 24. https://www.youtube.com/watch?v=zFGXTQnJETg. Yang, Emilia. n.d. “Marias Clandestinas.” Subversive Research. https://emiliayang.org/portfolio/marias-clandestinas/.